HomeHow to create a module in OpenERP ? How to create a module in OpenERP ? 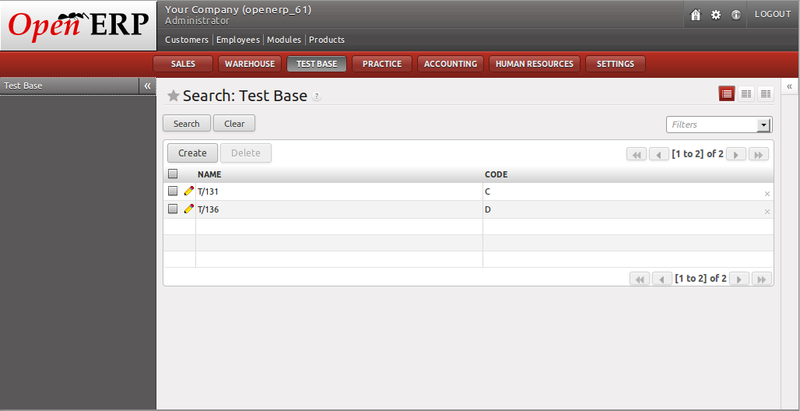 It is very easy to create a module in OpenERP. Find the below displayed screens. We will code to result this output. First of all, we will see the architecture of a typical OpenERP module. All the modules are located in server/addons directory. – create a subdirectory in the server/addons directory having module name test_module. – create the Python file containing the objects. – create .xml files that download the data (views, menu entries, demo data, …). – optionally create reports, wizards or workflows. We will see each files introduction one by one. ← How to backup and restore OpenERP database ? Great tutorial. How different is this process for OpenERP 7.0? -Thanks! Thanks, but that is for how to install a module (one-click! ), but I am interested in *creating* a new module. @jyothish mohan: I got a similar error message as you did. It happened to me as I copy/pasted the code given. It so happens that the code is not using the sign “. It is using another look-alike sign which is “. You will not notice it easily. Try zooming in on the page or this reply and you will see the difference. I am putting both here side by side ” “. You need to replace the one in the code with the one found on the keyboard which is ” (please enlarge to see difference). There is also one typo in __openerp__.py; It references the file test_view.xml, but the author suggested to create a file called text_view.xml. This will give you an IOError of type “File not found…”. You need to have the same name in the reference as for the file. Next typo is still in file __openerp__.py. It says ”’Test Base Class”’. See how the ” and ’ are interchanged at beginning and end. First use the correct sign” and correct order like this ‘”Test Base Class”‘. Once you install this module, you should see the button TEST BASE on the top main menu bar. I am using OpenERP 6.1.1. Apart from that, thanks for the tutorial. Someone told me on IRC that modules for 6.x are incompatible with 7.x is this true? If there are only python files then sometimes 6.x module will work. But because of changes in view structure, it may not work. ERROR: Module: test_module could not be imported (file: C:/Users/Ishtiaq/workspace/openerp-7.0-20130715-231029/openerp/addons/testmodulue/test_module.py). any chance of knowing for odoo 8 or 9?